This calculator will help you compute your 18-hole golf handicap index. While you can enter information for up to 20 rounds, you’ll need to provide information for at least your last 5 rounds to accurately calculate your handicap. In the fields provided, include the USGA course rating, the USGA course slope, and your 18 hole score. The USGA course rating and the course slope can be found using the USGA database. Once you’ve inputted the necessary information, press “Compute Handicap Index,” and you’ll see your golf handicap. Good luck out on the links! If par for a round is 72, the course rating might be something like 71 or 73.3, depending on what tee you use and if you are a man or a woman. The course slope rating has a minimum of 55, an average of 120, and a maximum of 155, with higher numbers being harder courses. If you do not have the course rating & slope you can look them up using the USGA database. A golf handicap is a calculation used to analyze your ability to play on a specific course. The primary use of a golf handicap is to make the game fair when experienced golfers and inexperienced golfers play one another. Once calculated, a golf handicap accurately compares expected golf scores based on the golfers' expected performance. 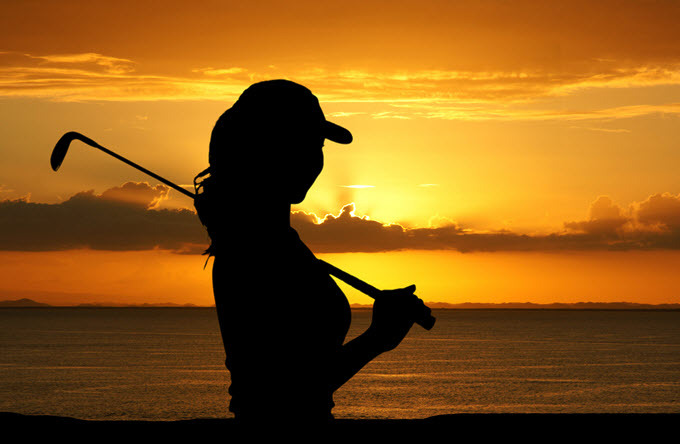 Many golfers compare their handicaps to find other golfers with similar golfing abilities. Your handicap is a good indication of how good you are at the game. Most golfers strive to reduce their handicap so that they can compete more evenly with better golfers. A low handicap brings you respect and can make you a coveted player for a team. Here are seven tips to improve your golf handicap. Practice does not always make perfect, but practicing perfect will improve your game faster than anything. When you practice, proper form of your stance and swing are imperative. Read books and study professional videos to learn about form and mechanics of your swing and stance. Use equipment properly, and study the course that you will be playing so that you may manage it effectively. It is an excellent idea to sign up for lessons with a golf professional. Little tweaks in your mechanics can improve your current game and handicap significantly. Old and worn out equipment will negatively affect your game. If you can no longer see the grooves on your wedges or your grip is unraveling, it is time to upgrade your clubs. Update your golf balls while you are at it. Better balls also aid in better play. When updating your equipment, make sure you are fitted for your clubs. Guessing wrong and having clubs that do not fit your body correctly will add strokes to your game. Diversify your courses for a more rounded game. When you play on the same course consistently, you get used to its characteristics and can overcome obstacles by compensating based on familiarity. This can lead to an under-inflated handicap. Play on diverse courses with faster greens and more hazards for overall improvement and a more accurate handicap. Playing alone gives you the chance to try new things. You can experiment with clubs and analyze your game better without the unsolicited advice of players around you. Use a range finder for accurate yardage to come closer on well-struck iron shots. Analyze putting and fairway accuracy through experimentation. Take extra balls to compensate for lost balls when experimenting. Playing in rain, cold, heat, and on rough courses will improve your game. The more experience you have playing in diverse weather conditions, the better and more accurate your game and handicap will become. If you are not used to playing in less than perfect conditions, one bad game in adverse conditions can kill a handicap. If you get used to playing in rain or cold, you could score a great game while other golfers card bad scores that may inflate their handicaps. Tracking your stats will give you concrete information on factors that improve your game or make it worse. This is a great way to understand where your game needs more practice. How many putts per hole is your average? How many fairways did you hit? There are some great apps available for smartphones that can help you analyze your game while you play. The sole purpose of practice is to improve your game and lower your handicap. By tracking your scores and keeping a real handicap, you can continuously monitor your game so that you know when it improves. It also gives you a good gauge for competing in games with better golfers. Lowering a handicap does not happen overnight, but it will happen with hard work, education, and perseverance. It can take years to improve a handicap by 10 strokes, but you can achieve it quicker through game diversity, understanding your strengths and weaknesses, using proper form and mechanics, and keeping equipment in good condition.